The lustre of silver without the expense. 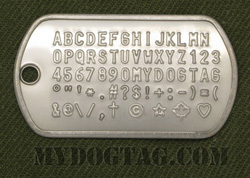 Shiny stainless steel dogtags make ideal "Silver Medal" replicas that you can customize. Customize to Buy your Silver Medal Medallion now! All orders are shipped within 1 business day and are usually delivered within 1 week (in North America). 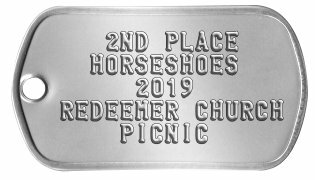 If you need any assistance creating or ordering your Silver Medal Medallion please contact us directly, we are here to help!